Is there something “new” at the Gap brand stores you’ve had your eye on? You know I don’t by anything unless it’s on sale so I’m glad to see this 30% off code. 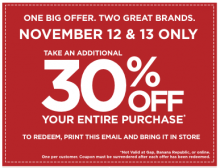 Here is a great coupon for 30% off your entire purchase at Gap and Banana Republic Outlet stores. Take the printable coupon with you this weekend for extra savings. Discount applies to merchandise only, not to gift cards. Each coupon is good for one time use and must be surrendered after both offers have been redeemed. Limit one coupon per customer per transaction. Coupons Nov 12, 2011 in BananaRepublic, Gap · Expired!